Everlight posts stellar revenue result in June. Bucking the sales revenue downturns among almost all of Taiwan's light emitting diode (LED) makers in June this year from the previous month, Everlight Electronics Co., Ltd.'s consolidated June revenue increased 10.38 percent month on month to NT$2.42 billion (US$78.32 million) to be the island's sole profitable maker of LEDs for lighting. Executives of the world's No.1 LED packager by volume ascribe such growth mostly to the company's success in diversifying product portfolio and the rising demand incidental to falling prices of lighting LEDs since the market as a whole did not grow in June, during which the company shipped 20 percent more LEDs than in May. 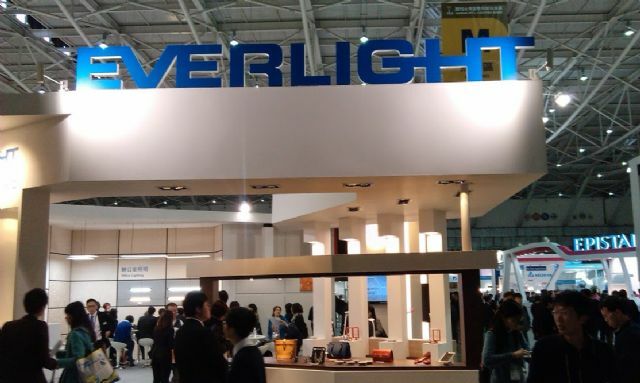 They feel that despite the intensifying price competition across the industry, Everlight could be the only profitable maker in Taiwan's lighting-LED industry at the current price point thanks to its enormous economy of scale. They also project the company's shipment of lighting LEDs to surge 20 percent in the third quarter from the second quarter. The June result helped push up the company's revenue for the first six months of this year 2.74 percent year on year, to NT$14.29 billion (US$461.25 million), although the company's consolidated revenue of NT$7.05 billion (US$227.51 million) for the second quarter represented a 2.5 percent drop from the first quarter. Industry executives blame the recent underselling competition among LED-lighting makers worldwide on Philips' dumping of excess inventory. Underselling competition in the LED lighting sector plus weak market for LED backlights hurt sales of most of Taiwan's LED makers in June, with chipmakers posting deeper declines than packagers. Of the worse performers among the chipmakers was the plummeting rate of blue chip's average selling price (ASP) that saw double-digit drops. Blue chip is essential in most household LED light bulbs. Industry executives point out the price of the chip began falling after Philips began dumping its LED light bulbs in the second quarter in North America far below US$2.7 apiece. They calculate that US$2.7 as the reasonable price point for the Philips LED bulbs based on the estimate that the average factory price of such bulbs at US$2 and the reasonable retail profit margin of 35 percent. Epistar Corp., the world's No.1 LED chipmaker by volume, had revenue of NT$1.91 billion (US$61.87 million) in June, down 15.52 percent from May to mark a second month of sales decline. The June revenue represented a 32.01 percent decline from the same month of last year. In the Jan.-June period, the company's consolidated revenue totaled NT$13.41 billion (US$432.74 million), down 6.62 percent from the comparable period of last year. But the company's executives point out that the company's revenue of NT$6.77 billion (US$218.38 million) for the second quarter showed an improvement from the first quarter. Epistar Chairman B.J. Lee estimates the company's production lines for lighting chips to reach full capacity sometime in the second half of this year and lighting chip sales for the third quarter to exceed that in the previous two quarters combined, basing such bright business outlook on the projection that LED lighting prices would climb steadily soon after the unbridled competition in the second quarter. Lextar Electronics Crop., an integrated manufacturer supplying almost every LED product including chips, packages, modules and lighting fixtures, saw its consolidated revenue for June drop slightly from May due chiefly to lukewarm market for LED backlights for information-technology systems such as PCs. However, the company's consolidated revenue of NT$3.60 billion (US$116.12 million) for the second quarter represented a 2.8 percent increase from the first quarter and its revenue of NT$7.10 billion (US$229.09 million) for the first half represented a 1.37 percent gain from the same half of last year. Ledtech Electronic Corp., a packager known for LED lamps used in refrigerators, had consolidated revenue of NT$140 million (US$4.51 million) in June, shedding 17.16 percent from a month earlier due to weak market for refrigerator lighting. Nevertheless, the company's consolidated revenue of NT$854 million (US$27.54 million) for the Jan.-June period represented a 1.37 percent increase from the same period of last year.